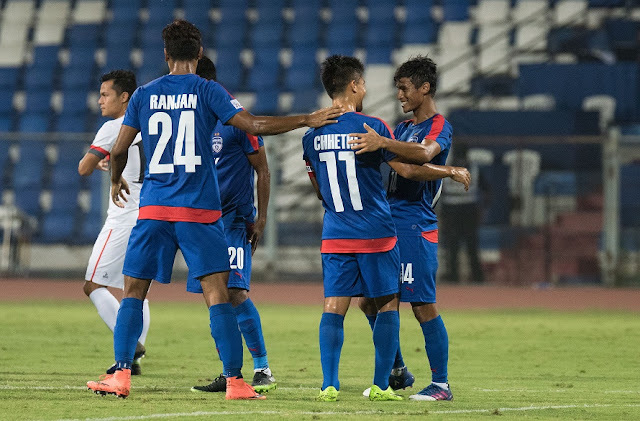 Bengaluru FC's entire season was marred by the fact that they were not scoring enough goals. They were creating several chances but were failing in the final third. It seem that the Blues have finally solved their finishing problems as they scored seven times against a helpless DSK Shivajians. 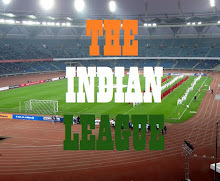 It was a performance of the magnificent Bengaluru FC that the fans are used to see at their fortress. In a sublime show in their penultimate game in the 10th edition of I-League, the Blues thrashed DSK Shivajians 7-0. In a rarity of sorts in such a high scoring game, all goals were scored by Indian players. DSK gaffer decided to bring in Soram Poirei under the bar instead of first choice Subrata Paul, who had an excellent outing against East Bengal last week. For Bengaluru, coach Albert Roca handed start to medio Alwyn George. That opened the floodgate of goals for the Blues - Alwyn George joined the party two minutes later. Midfield maestro Eugeneson Lyngdoh scored a left-footed scorcher after three minutes. Striker Seiminlen completed the quota of first half goals in the 31st minute. After changing ends, DSK was successful in checking hosts from scoring for 20th minutes. Meanwhile, CV Vineeth replaced Len in the 58th minute. Bengaluru then continued their good job, their 5th goal came from skipper Sunil Chhetri again. Vineeth became the latest to join the party twelve minutes later. India international Sandesh Jhinghan, playing as central defender hit the final nail in the coffin in the 90th minute. With the win, the Blues extend their winning spree to the fifth game this season, across all the competitions they're competing in.